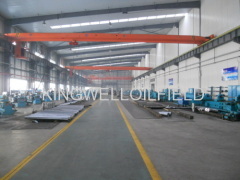 XI'AN KINGWELL OILFIELD MACHINERY CO.,LTD(KINGWELL), is a highly reputable supplier for oilfield equipment and services to Oil & Gas industries and provide complete solutions. 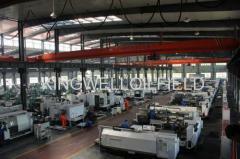 With over 10 years developing, we were developed from the beginning drilling service to manufacture factory who produce Drill Stem Testing( DST)Tools, Stabilizer and forgings, Drill pipe&HWDP, Drill Collar, Mud Pump and parts , etc. Kingwell are API and BV certified company, having all the Quality Systems in place for design, planning, manufacturing and quality monitoring & traceability to ensure our products match the highest quality standards. Our engineers are familiar with our tools, having rich experience working on the field. Meanwhile, Third party inspection is available. We could arrange Third Party Inspection if the customer asks for, also could provide complete service for testing. We assure one year warranty for our products. Besides our produced products, we have a professional export team on behave of BOMCO, HH, RS, RG manufacturers, providing their brand products all over the world. With the long term partner relations with these famous manufacturers, we could provide complete serves as well as competitive price and good delivery time. We are looking forward towards a long lasting association with your esteemed organization for our mutual benefit. Any reasonable documents with the shipments depend on your requirements. Now, our products have been exported to Europe, American and Middle East with good reputation and timely service! Please contact us for any enquiry within our manufacturing scope and we will be happy to serve you by supplying quality products.